Hello and welcome! 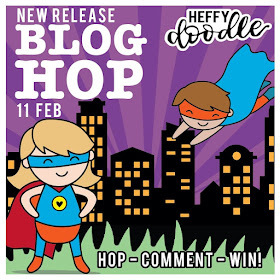 I am so excited to celebrate our Heffy Doodle Release 6 blog hop. 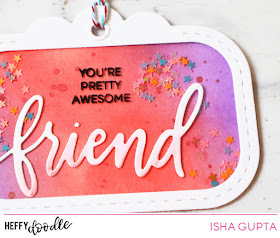 You are going to love this release as it has lots of awesome stamps, dies and stencils! You should've come here from the very talented Jessica's blog. It was so difficult to stop creating using the new products, I will be sharing a few of them in coming days. For today, I have a card and a couple of tags for you. For my card, I used the Big Bug Hugs clear stamp along with the Big Bug Hugs Dies, Grassy Lass Border, Imperial Stitched Rectangle and Swirly Cloud dies! I started by creating the background wash using distress inks. I then stamped the images and colored them using Derwent inktense pencils. Now I fussy cut the images. I then die-cut the clouds and the grassy border. Sponged some distress inks to the grass and stamped the sentiment onto it. Finally assembled everything together. 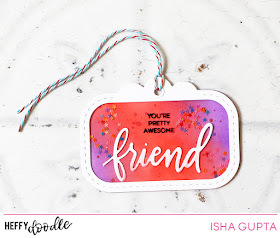 The Tag Along dies along with the word dies made creating these Tags so easy and FUN!!! For the first tag, I used the Tag Along dies, My Hero Word Dies, Bots of Love dies and Bots of Love Stamp. I simply die-cut the base and the frame of the tag. Adhered a piece of acetate behind the frame. I then sponged some distress inks to the back piece and adhered the confetti stars.I then stamped the Robo image, colored it and die-cut it. I adhered it to the tag base. 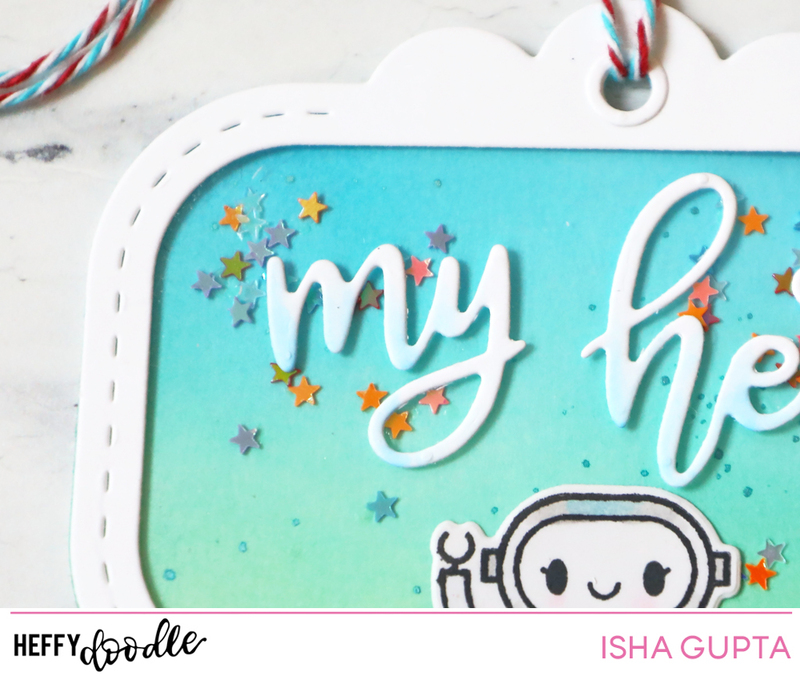 I then die-cut the word "My Hero", sponged some distress inks to it to create ombre effect and adhered it to the tag frame piece. 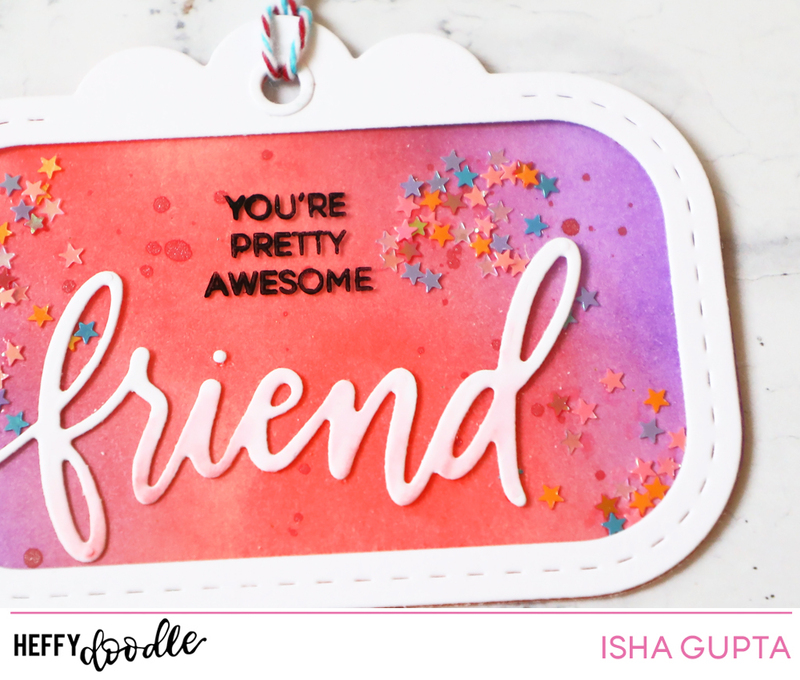 For the next tag, I simply added the word "FRIEND" to the frame and stamped the sentiment from the Whatcha Saying Now Stamp set. It's a hop and there is a prize...YAY!!!! 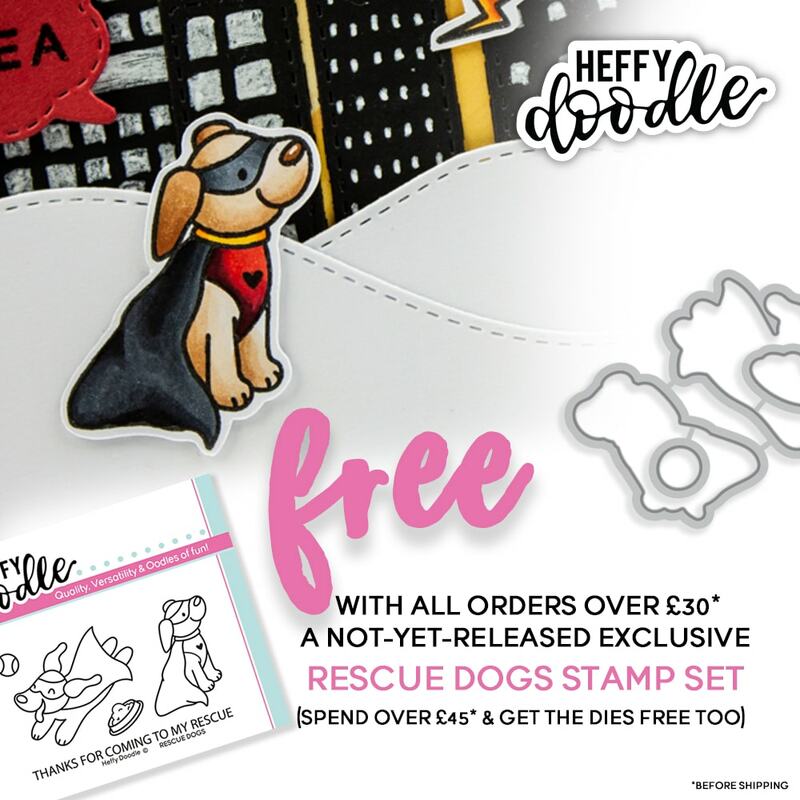 A random winner will be selected for a £50 gift certificate to the Heffy Doodle store. To be eligible, leave comments across the entire blog hop by 11:59 PM EST on February 18th 2019. 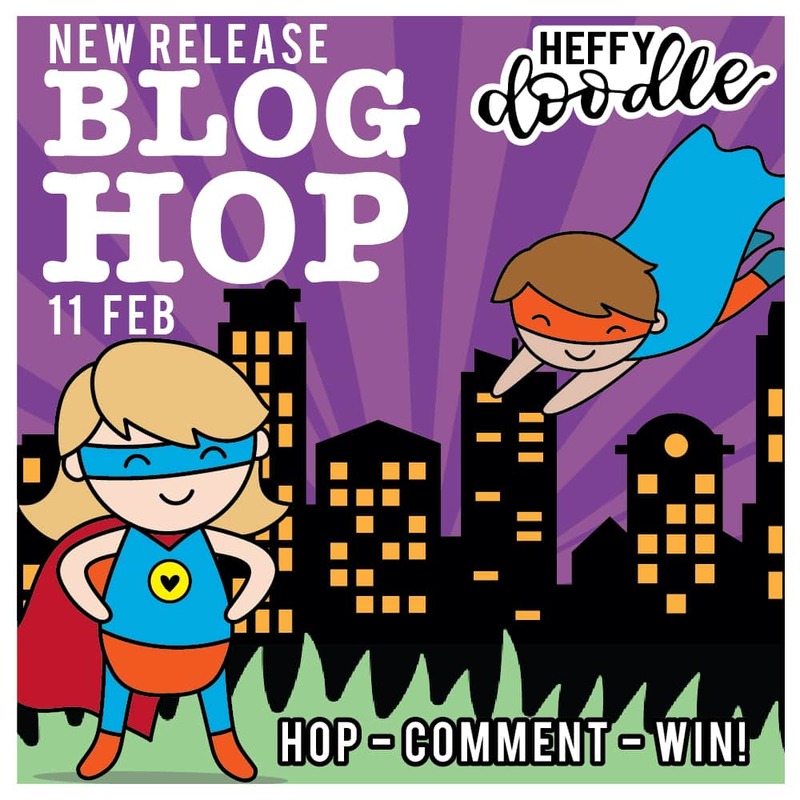 Winners will be announced on the Heffy Doodle Blog on 20th February 2019. That's not all. 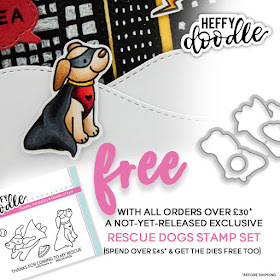 there is a Promo going on - spend £30 to get Rescue Dogs stamps, spend £45 to get stamps and dies. Hope you enjoyed some awesome inspiration by the team! Thank you for stopping by. Have a wonderful crafty day! Love all the projects! The tag die is really fun... I love that you can put acetate in the middle and do a see through tag. The card is so cute but I am so in love with those tags!! They are beyond cute! Awww you created a lovely scene in the card. Love the cute little snail and dragonfly. The tags are looking awesome!! Such a sweet scene on your adorable card and your two tags are wonderful too! I love this- the tags are so cute! I love the little stars behind the robot. Adorable! The tags colors are awesome. Love that snail. Adorable. I can almost feel spring through your card; it's a beauty ! Your tags are fun; the background of the "friend-tag" is great. That sky turned out terrific for these darlings and I love those tags!! Cute and colorful card and tags.